Did you know that your body eliminates toxins and wastes through the skin? The skin is the largest organ of the body, but most people only concern themselves with the skin on their face. There are many benefits of Dry Body Brushing. Dry Body Brushing (DBB) has many health benefits as well as a beauty benefit too! Dry Body Brushing has been around for centuries and practiced by many different cultures. This exfoliation process improves the texture of our skin by sloughing off dead skin cells that become clogged over time. Also, by removing the dead skin cells the skin can finally breathe as it releases toxins and wastes. Dry Body Brushing stimulates the lymphatic flow through the body as it massages the lymph nodes – encouraging removal of excess water and toxins. Our bodies naturally do this but DBB helps to stimulate more blood flow boosting circulation which not only benefits our skin but our organs as well. The beauty benefits are the improvement of the texture of skin, and the reduction of cellulite. It does this by softening the lumpy bumpy deposits beneath the skin – this is from circulation of blood flow into that area. In addition to removing the dead skin cells – your skin will glow as the dry dead skin cells are finally removed. Now your skin will be able to hydrate more efficiently when you apply moisturizer. 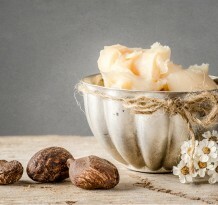 My favorite natural body moisturizer is shea butter. Use a brush made of natural fibers – bristles should be firm and the handle of the brush should be long for those hard to reach areas. Start with the soles of your feet working upward to the legs and arms etc. (avoid varicose veins and private areas as well as the face). Always use a gentle but firm motion that moves towards the heart (not a scrubbing motion; but with long straight strokes). For the back area – use a motion moving from the neck down to the lower back. As with the arms, brush up towards the armpits. Again, the pressure should be firm not painful. Skin should look refreshingly pink, not red or irritated. I like to do this in the morning as it feels so invigorating. Do before a shower to rinse the dead cells off. 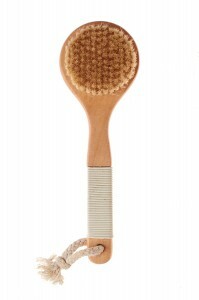 Dry Body Brushing can be done on a daily basis – process can be 10 minutes or more. I personally do this about 4 to 5 times a week. I love the way my skin feels as it looks so rejuvenated and soft. Where to get a Dry Body Brush? Try finding a brush at your local health food store or online. Most important be sure the bristles are firm. Check out this, quick, 2-minute Dry Body Brushing demonstration and tips video. I just found your website and love it so far! Dry skin brushing has been a part of my daily routine for quite a while now thanks to my mom for introducing it to me. I found it to be THE best way to get beautiful, soft, glowing skin!! I never have to use lotion anymore!